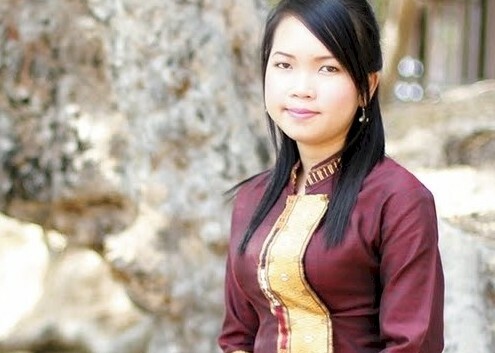 One of the best & pretty country singer from the largest province in Laos – Savannakhet, home of the largest mine – Sepon mine, the Wat Inghang temple – built to commemorate a visit of Lord Buddha, the national hero Kaysone Phomvihane – the founder of the Lao People’s Revolutionary Party and the emerging country singer Moukdavanyh Santiphone. Moukdavanyh Santiphone is coming from music family hence she exposed to music at tender age. Living in That Inghang village, she started singing with family music band called Krauy Zook Kiew when she was just six years old. She has been singing and touring occasionally with the band around Savan city metro ever since. After the release of an album called Mone Huk Bao Meaung Vang, it has made her become the most famous country singers in the history of our changing time. Her songs are by far the most view ever in Youtube ahead of any Lao artists. Since there is no doubt that she has been the best female country artist. This recognised by her crowned as a winner for the best female country singer category in Lao Music Award 2014. Ten excellent country songs are in the album namely Seng Khene Thene Jai, Mone Huk Bao Meaung Van, Sao That Inghang Yang Koy, Eune Ai Xai Mao Neung, Viva Gone Phansa Hoophuk HoopNamta. Songs like these simply demonstrate her brilliant. Nine songs from the album are written by Olia Louklard-Inghang originally from Savannakhet He currently lives in France. Her most view song on youtube is Eune Ai Xai Mao Neung is written by Vath Vatasin who is currently living in Thailand. The largest province in Laos has renowned for producing some of the finest Laotians known, namely Kaysone Phomvihane, Nouhak Phoumsavan, Bounyang Vorichith and now Moukdavanyh Santiphone. Sathalanalat Paxathipatai Paxaxon. LAOS PDR.